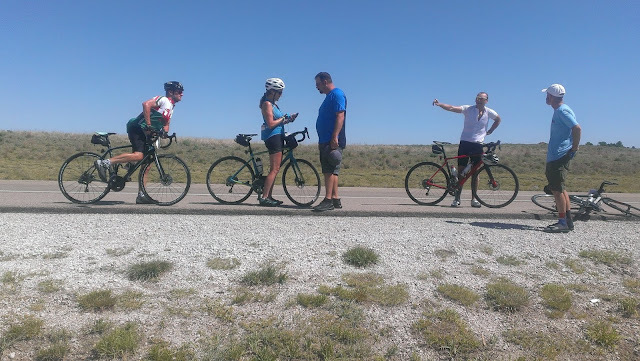 The route today took our riders into Kansas, along Hwy 54 which proclaimed itself the official "yellow brick road". This is in reference to the classic movie "The Wizard of Oz" based on the book by Frank Baum. The 1939 movie tells the story of Dorothy, who with her little dog Toto, lives in Kansas. One day she is picked up by a tornado and transfered to the land of Oz. To return home, she must follow the "yellow brick road". On the way she meets the Tin Man, the Scarecrow and the timid Lion. Our riders had a much easier time than Dorothy. With only 40 miles to ride and a lovely tailwind, all agreed this was a most enjoyable day. I also enjoyed a journey on the yellow brick road today and met some very interesting people. This started off with a brief bike ride to the Sunset Lake, where I met Toto (Wee Laddie). This little fellow was the runt of a Scotti litter and therefore offered for sale in a pet shop...a rarity. The happy owner was delighted to find a Scotti for sale and he is the companion of her retirement. Returning to the hotel in Guymon, I drove on into Liberal and looked for the Dorothy's House Museum. After getting lost, I flagged down a passing motorist and he led me to the museum. We then had a most wonderful long and interesting conversation about his life and the history of his people who still have land outside Tucumcari. He also related how Liberal got its name: from one of the first settlers in the area who dug a well, found water and then offered it free of charge to passing travellers. "That's very liberal of you" thirsty recepients said. After Emil freshened up at the hotel in Liberal, we went with Greg for our first Subway experience (how about that, Chris!) Then we visited the Liberal Air Museum, where there was a third opportunity for a fascinating conversation:with storm chasers. These people follow the hurricanes and tornadoes, trying to keep out of their way while still getting the best shots. At dinner we discovered that Tom had made an enormous effort to provide us with a surprise appropriate to the day: the owner of Dorothy's House, as well as "Dorothy" and a delicious cake depicting the yellow brick road, were waiting for us in the dining room. Thank you Tom!